Kimleigh Chemicals SA is one of the largest manufacturers of copper based chemicals in South Africa. 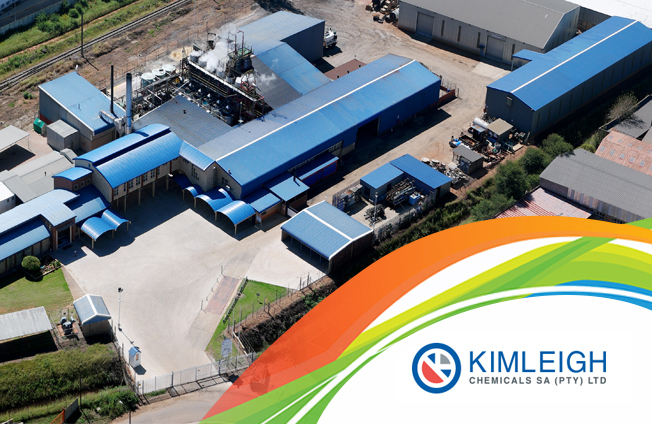 Founded in 1990, Kimleigh Chemicals SA is a privately owned company who has obtained three ISO and one OHSAS accreditations. We are proud of our accomplishment to continuously comply with the standards as laid out in the health, safety, environmental and quality management systems since 2011. The factory and laboratory are housed in very modern facilities and the site is located in Potchefstroom, in the North West Province of South Africa. We capitalise on our ability to produce and market competitive products and are able to supply locally as well as internationally. Kimleigh Chemicals SA has shown phenomenal growth specialising in the production of quality inorganic copper based chemicals such as copper sulphates and its derivatives. We concentrate on supplying only the best quality products and providing superior customer service. Integrity and efficiency form the foundation from where our business operates and develops. Our strength lies in our modern technologies, advanced equipment, staff and manufacturing experience. Kimleigh Chemicals SA will become the best in its class. We will achieve this goal through dedicated staff, committed research and development, increased productivity, passionate marketing and compliance to SHEQ standards. To develop environmentally acceptable products and related services that address market needs through innovative chemistry. In striving for excellence, we will be the preferred formulator, manufacturer and distributor to our customers. We commit ourselves to sustain stakeholder value in our organisation. Our vision “dream with a plan” is clear in our commitment to innovative chemistry. We’ve identified the need to establish a liquid processing plant close to our mining customers in the Rustenburg area and the site in Mooinooi was established early in 2008. Activities at this site also comply with our accredited ISO and OHSAS scope of standards. Mixing facility conveniently close to customers. The use of the concentration as is (no further dilution equipment required). Ease of use! No need for make up equipment. Easy integration into PLC control. Easier ISO 14001 implementation (NO dust potential & lower spillage potential). May be more acceptable to organised labour. Less labour required, resulting in personnel cost savings. No further equipment maintenance costs.